I have an LP that has the stamps and etchings to be this release, but the label is definitely post-1978. Any ideas the actual release date? Sounds fantastic, a must own SA-CD. Try to get one when the stock lasts. I have the Matrix with the '1A-2G:' at the end, but my back cover has 3 lines of writing at the bottom. 'MANUFACTURED AND DISTRIBURED BY / FABRIQUE ET DISTRIBUE PAR COLUMBIA RECORDS OF CANADA, LTD.
(R) EPIC □ MARCAS REG. Would this be a different release or just a variant? One of Beck's best, but not the best pressing to have. CBS Mastersound releases are notorious for poor EQ, and this one is no exception. Half-speed mastering requires different EQ than standard, and this was not done for the majority of this series. Compared side by side with the CD, this pressing sounds thin and lacks the depth and punch of the CD version. Blow by Blow is a critic,s pick apart record due to the fact the song,s are all over the map. Jeff,s improvisation skill,s stand out through out this entire album.The musicians in the band compliment one another with superb interplay and creativity.Every song has a particular feel and texture that blends together like a soufflé. Mine is VG+ PE 33409 (AL/BL 33409) but I can't find any information on this version, which mysteriously has AL 33409-1AE COLUMBIA NY Stamped in the dead wax of side 1 and BL 33409 G2A MKC etched in the dead wax on side 2! Blue/black Epic label, cursive "epic" with rainbow color, light, says made in US. Any ideas? All the CD versions I've seen of this album repeat the same indexing error. "AIR Blower" is around 3'26" in duration; the remainder (about 1'41") is the first part of "Scatterbrain". 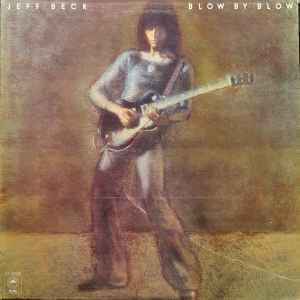 Compare with early versions of the LP or compare with the version on "Jeff Beck with the Jan Hammer Group Live".